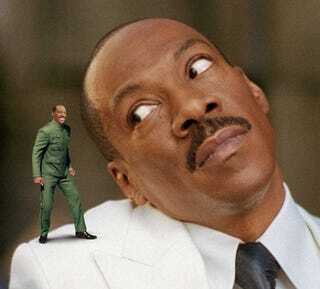 Does Anybody Want To See Eddie Murphy's Little Man? What's going on with Meet Dave, Eddie Murphy's new scifi comedy? It's coming out July 11, and there's barely been a peep about it, aside from a trailer a while ago. No buzz, no press. And it doesn't sound as though it'll be screened for critics. Update: Actually, it is being screened after all. With a script co-written by MST3K alum Bill Corbett, the story of a human-shaped spaceship, with a bunch of tiny people inside, could be a blast. So what happened? Meet Dave is, sadly, not [worth watching]. The Naked Cowboy's cameo is funnier than the rest of the movie, and that's downright tragic. Still, Murphy's last collaboration with Dave director Brian Robbins, Norbit, made $96 million domestically. And Murphy has already re-teamed with Robbins for a third film, called A Thousand Words. Due in 2009, it's the story of a blase guy (Murphy) who learns that he'll die as soon as he finishes saying a thousand words. So, I guess, he has to be very, very laconic.